Redirecting to: www.famous-trials.com/thomasmore in (10) seconds. The Trial of Sir THOMAS MORE Knight, Lord Chancellor of England, for High- Treason in denying; the King's Supremacy, May 7, 1535. the 26th of Henry VIII. Bill being preferred in Parliament, No­vember 1534. to attaint Elizabeth Barton, and several others of High-Trea­son, Bishiop Fisher and Sir Thomas Moore were also brought into it for Misprision of Treason, for the refusing of the Oath of Succession— Says my Lord Herbert. The fame Au­thor avows the Bill did so pass; but Sir Thomas's Great-Grandson, in his Life, shews the contrary, and that notwithstanding the Archbishop of Can­terbury, the Lord Chancellor, Duke of Norfolk, and Secretary Cromwell, by the King's Command, went to him and pressed him to a Compliance; yet the Chancellor influenced the King so far, that the matter of Misprison was dropt. Sir Thomas was also examined at other times by the Lord Chancellor, Dukes of Norfolk and Suffolk, Mr. Secretary, and others of the Privy-Council, who press'd him, with all the Arguments they could think of, to own the King's Supremacy in direct and open Terms, or plainly to deny it; but he being loth to aggravate the King's Displeasure, would say no more than that the Statute was like a two-edged Sword, for if he spoke against it, he should be the Cause of the Death of his Bo­d ; and if he assented to it, he should purchase the Death of his Soul. Those Examinations being over, Richard Rich, newly made Sollicitor Ge­neral, and afterwards Lord Rich, with Sir Ri­chard Southwell, and Mr. Palmer, Secretary Crom­well's Man, were sent by the King to take away his Books. Rich pretending Friendship to him, and protesting he had no Commission to talk with him about the former Affair of the Supremacy, he put a Case to him thus: If it were enacted by Par­liament that Richard Rich should be King, and that it should be Treason in any body to deny it, what Offence it were to contravene that Act? Sir Thomas Moore answered, That he should offend if he said so, because he was bound by the Act; but, that this was casus levis. Whereupon Sir Tho­mas said, he would propose a higher Case: Sup­pose it were enacted by Parliament, Quod Deus non sit Deus, and that it were Treason to contra­vene, whether it were not an Offence to say it according to the said Act,? Rich reply'd, yea; but said withal, I will propose a middle Case, be­cause this is too high: The King, you know, is constituted supreme Head of the Church upon Earth; why should not you, Master More, accept him for such? as you would me, if I were made King by the aforesaid Supposition. More answered, the Case was not the same, because, said he, a Parliament can make a King, and depose him; and that every Parliament Man may give his Consent hereunto, but that a Subject cannot be bound so in the Case of Supremacy. Quia consensum ab eo ad Parliamentum praebere non potest (so says my Lord Herbert) it is in my Copy if it be not mistaken, & quanquam Rex sic acceptus sit in Angha, plurima tamen Partes exterae idem non affirmant. The Indictment was Very long, but where to procure a Copy of it, I could never learn; it's said in general, it contain'd all the Crimes that could be laid to the charge of any notorious Malefactor; and Sir Thomas professed it was so long, that he could scarce remember the third part of what was objected therein against him. It was read aloud by the Attorney-General; and Sir Thomas's mortal Sin seem'd plainly to be his refusing the Oath of Succession, already mention'd. To prove this, his double Examination in the Tower was all edged against him, the first before Secretary Cromwell, Thomas Beade, John-Tregonnel, & c. to whom he professed he had given over all Thoughts of Titles either to Popes or Princes, tho the whole World should be given him, he be­ing fully determined only to serve God. The second time before the Lord Chancellor, the Duke­ of Suffolk, Earl of Wiltshire, and others, before whom he compared that Oath to a two-edged Sword, as before observed. You see now how grievously you have offended his Majesty ; yet he is so very mer­ciful, that if you will lay aside your Obstinacy, and change your Opinion, we hope you may obtain Pardon and Favour in his sight. But Sir Thomas stoutly reply'd, Most Noble Lords, I have great reason to return thanks to your Honours for this your great Civility, but I beseech Almighty God, that I may continue in the Mind I am in, thro' his Grace, unto Death. Then having Intimation given that he might say what he thought fit in his own Defence, he began thus: When I consider the length of my Accusation, and what heinous Matters are laid to my charge, I am struck with Fear, left my Memory and Understanding, which are both impaired, together with my bodily Health, thro' a long Indisposition contracted by my Imprison­ment, should now fail me so far, as to make me incapable of making such ready Answers in my Defence, as otherwise I might have done. The Court being sensible of his Weakness, or­dered a Chair to be brought in, wherein he might feat himself, which he did accordingly, and then went on thus. This my Indictment, if I mistake not, consists of four principal Heads, each of which I purpose, God willing, to answer in order. As to the first Crime objected against me, that I have been an Enemy out of stubbornness of Mind to the King's second Marriage; I confess, I always told his Majesty my Opinion of it, according to the Dictates of my Conscience, which I neither ever would, nor ought to have concealed: for which I am so far from thinking my self guilty of High-Treason, that on the contrary, being re­quired to give my Opinion by so great a Prince in an Affair of so much importance, upon which the Peace of the Kingdom depended; I should have basely flatter'd him, and my own Conscience, had not I spoke the Truth as I thought: Then indeed I might justly have been esteemed a molt wicked Subject, and a perfidious Traitor to God. If I have offended the King herein; if it can be an Offence to tell one's Mind freely, when his Sovereign puts the Question to him; I suppose I have been sufficiently punish'd already for the Fault, by the great Afflictions I have en­dured, by the loss of my Estate, and my tedious Imprisonment, which has continued already near fifteen Months. The second Charge against me is, That I have violated the Act made in the last Parliament: that is, being a Prisoner, and twice examined, I would not, out of a malignant, perfidious, obstinate and traitorous Mind, tell them my Opinion, whether the King was Supreme Head of the Church or not; but confessed then, that I had no­thing to do with that Act, as to the Justice or Injustice of it, because I had no Benefice in the Church: yet then I protested, that I had never said nor done any thing against it; neither can any one Word or Action of mine be alleged, or pro­duced, to make me culpable. Nay, this I own was then my Answer to their Honours, that I would think of nothing else hereafter, but of the bitter Passions of our Blessed Saviour, and of my Exit out of this miserable World. I wish no body any harm, and if this does not keep me alive, I desire not to live; by all which I know, I would not transgress any Law, or become guilty of any treasonable Crime: for this Statute, nor no other Law in the World can punish any Man for his Si­lence, feeing they can do no more than punish Words or Deeds; 'tis God only that is the Judge of the Secrets of our Hearts. Attorney. Sir Thomas, tho we have not one Word or Deed of yours to object against you, yet we have your Silence, which is an evident sign of the Malice of your Heart: because no dutiful Subject, being law­fully ask'd this Question, will refuse to answer. Sir Thomas More. Sir, my Silence is no sign of any Malice in my Heart, which the King him­self must Own by my Conduct upon divers Occasions; neither doth it convince any Man of the Breach of the Law: for It is a Maxim amongst the Civilians and Canonists, Qui tacet consentire videtur, he that holds his peace; seems to give his Consent. And as to what you say, that no good Subject will refuse to give a direct Answer; I did really think it to be the Duty of every good Subject, except he be such a Subject as will be a bad Christian, rather to obey God than Man; to be more cautious to offend his Conscience, than of any thing else in the whole World ; especially if his Conscience be not the Occasion of same Sedition and great Injury to his Prince and Country : for I do here sincerely protest, that I never revealed it to any Man alive. I come now to the third principal Article in my Indictment, by which I am accused of malicious Attempts, traitorous Endeavours, and perfidious Practices against that Statute, as the Words there­in do alledge, because I wrote, while in the Tower, divers Packets of Letters to Bishop Fisher; whereby I exhorted him to violate the same Law and encouraged him in the like Obstinacy. I do insist that these Letters, be produced and read in Court, by which I may be either acquitted or convinced of a Lye; but because you say the Bishop burnt them all, I will here tell you the whole truth of the matter. Some of my Letters related only to our private Affairs, as about our old Friendship and Acquaintance: One of them was in answer to his, wherein he desired me to let him know what Answers I made upon my Examinations concerning the Oath of Supremacy; and what I wrote to him upon it was this, That I had already settled my Conscience, and let him satisfy his according to his own Mind. God is my Witness, and as I hope he will save my Soul, I gave him no other Answer; and this I presume is no Breach of the Laws. Law so any Man living, tho perhaps the King's Majesty has been told the contrary, There was little or no reply made to this full Answer by Mr. Attorney, or any body else; the word Malice was what was principally insisted on, and in the mouths of the whole Court; tho for proof of it no body could produce either Words or Actions: nevertheless, to set the best gloss that could be upon the Matter, Mr. Rich was called to give Evidence in open Court upon Oath, which he immediately did, affirming what we have already related concerning a Conference between him and Sir Thomas in the Tower, To which Sir Thomas made answer, If I were a Man, my Lords, that had no regard to my Oath, I had had no occasion to be here at this time, as is well known to every body, as a Criminal; and if this Oath, Mr. Rich, which you have taken be true, then I pray I may never see God's Face, which, were it otherwise, is an Imprecation I would not be guilty of to gain the whole World. More having recited in the Face of the Court all the Discourse they had together in the Tower, as it truly and sincerely was, he added: In good Faith, Mr. Rich, I am more concerned for your Perjury, than my own Danger; and I must tell you, that neither my self nor any body else to my knowledge, ever took you to be a Man of such Reputation, that I or any other would have any thing to do with you in a Matter of Im­portance. You know that I have been acquainted with your manner of Life and Conversation long time, even from your Youth to the present Juncture, for we lived in the same Parish; and you very well know, I am sorry I am forced to speak it, you always lay under the Odium of a very lying Tongue, of a great Gamester, and of no good Name and Character either there or in the Temple, where you was educated. Can it therefore seem likely to your Lordships, that I should in so weighty an Affair as this, act so unadvisedly, as to trust Mr. Rich, a Man I had al­ways so mean an Opinion of, in reference to his Truth and Honesty, so very much before my So­vereign Lord the King, to whom I am so deeply indebted for his manifold Favours, or any of his noble and grave Counselors, that I should only impart to Mr. Rich the Secrets of my Conscience in respect to the King's Supremacy, the particular Secrets, and only Point about which I have been so long pressed to explain my self? which I never did, nor never would reveal; when the Act was once made, either to the King himself, or any of his Privy-Counselors, as is well known to your Honours, who have been sent upon no other ac­count at several times by his Majesty to me in the Tower. I refer it to your Judgments, my Lords, whether this can seem credible to any of your Lordships. But supposing what Mr. Rich has swore should be true, seeing the Words were spoke in familiar and private Conversation, and that there was nothing at all asserted, but only Cases put without any offensive Circumstances; it cannot in justice be said, that they were spoke maliciously, and where there is no Malice, there is no Offence. Besides, my Lords, I cannot think so many reve­rend Bishops, so many honourable Personages, and so many virtuous and learned Men, of whom the Parliament consisted in the enacting of that Law, ever meant to have any Man punish'd with Death, in whom no Malice could be found, taking the Word Malitia for Malevoentia; for if Malitia be taken in a general Signification for any Crime, there is no Man can be free: Therefore this Word Maliciously is so far significant in this Sta­tute, as the Word Forcible is in that of Forcible Entry; for in that Case is any enter peaceably and puts his Adversary out forcibly, it is no Of­fence, but is he enters forcibly; he shall be punished by that Statute. Besides, all the unspeakable Goodness of his Majesty towards me, who has been so many ways my singular good and gracious Lord, who has so dearly loved and trusted me, even from my first Entrance into his Royal Service, vouchsafing to honor me with the Dignity of being one of his Privy-Council, and has most generously promoted me to Offices of great Reputation and Honor, and lastly to that of Lord High-Chancellor, which Honor he never did to any Lay­man before, the same being the highest Dignity in his famous Kingdom, and next to the King's Royal Person, so far beyond my Merits and Qualifications; honoring and exalting me by his Incomparable Benignity, for these twentyYears and upwards, heaping continual Saviors upon me; and now at last, at my own humble Request, giving me liberty to dedicate the Re­mainder of my Life to the Service of God for the better saving of my Soul, has been pleased to discharge and free me from that weighty Dignity; before which he had still heaped more and more Honors upon me: I say, all this his Ma­jesty's Bounty, so long and so plentifully conferred upon me, is enough, in my opinion, to invalidate the scandalous Accusation so injuriously surmised and urged by this Man against me. This touched the Reputation of Mr. Rich to the very quick, and was a Slur that could not be effaced, without the utmost difficulty; and the on­ly way to do it, was, is possible, to produce substantial and creditable Witnesses to attest the contrary: and therefore he caused Sir Richard Southwell, and Mr. Palmer, who were in the same Room with Sir Thomas and Mr. Rich when they conferred together, to be sworn as to the Words that passed between them. Whereupon Mr. Pal­mer deposed, what he was so busy in thrusting Sir Thomas’s Books into a Sack, that he took no notice of their Talk, And Sir R, Southwell likewise swore, that because his Business was only to take care of conveying his Books away, he gave no ear to their Discourse. Sir Thomas Palmer, KNT. Falper Leake, Gent. Sir Thomas Peirt, Knt. William Browne, Gent. George Lovell, Esq; Thomas Billington, Gent. Thomas Burbage, Esq; John Parnel, Gent. Geoffry Chamber, Gent. Richard Bellame, Gent. Edward Stockmore, Gent. George Stoakes, Gent. Now the Jury having withdrawn, scarce were out a quarter of an Hour before they returned with their Verdict, by which they found the Prisoner guilty; upon which the Lord Chancellor, as chief in the Commission for this Trial, immediately began to proceed to Judgment: which Sir Thomas observing, he said to him, My Lord, when I was concerned in the Law, the Practice in I am sure there are far more, who all the while such Cases was to ask the Prisoner before Sentence, whether he had any thing to offer why Judgment should not be pronounced against him. The Lord Chancellor hereupon stopping his Sentence, wherein he had already proceeded in part, asked Sir Thomas, What he was able to say to the contrary. Who presently made Answer in these words: For as much as, my Lords, this Indictment is grounded upon an Act of Parliament, directly repugnant ,to the Laws of God and his Holy Church, the Supreme Government of which, or of any part thereof, no Temporal Person may by any Law presume to take upon him, being what right belongs to the See of Rome, which by special Prerogative was granted by the Mouth of our Savior Christ himself to St. Peter, and the Bishops of Rome his Successors only, whilst he lived, and was personally present here on Earth: it is therefore, amongst Catholic Christians, insufficient in Law, to charge any Christian to obey it. And in order to the proof of his Assertion, he declared among other things, that whereas this Kingdom alone being but one Member, and a small part of the Church, was not to make a particular Law disagreeing with the general Law of Christ's universal Catholic Church, no more than the City of London, being but one Member in respect to the whole Kingdom, might enact a Law against an Act of Parliament, to be binding to the whole Realm: so he shewed farther, That Law was ,even contrary to the Laws and Statutes of the Kingdom yet unrepealed, as might evidently be seen by Magna Charta, wherein are these Words; Ecclesia Anglicana libera sit, & habet omnia jura integra, & libertates suas illcesas: And it is contrary also to that sacred Oath which the King's Majesty himself, and every other Christian Prince, always take with great Solemnity, at their Coronations. So great was Sir Thomas's Zeal, that he further alleged, that it was worse in the Kingdom of England to rest1se Obedience to the See of Rome, than for any Child to do to his natural Parent: for, as St. Paul said to the Corinthians, I have regenerated you, my Children, in Christ; so might that worthy Pope of Rome, St. Gregory the Great, say of us Englishmen, Ye are my Children, because I have given you everlasting Salvation: for by St. Augustine and his followers, his immediate Messengers, England first received the Christian faith, which is a far higher and better Inheritance than any carnal Sather can leave to his Children; for a. Son is only by generation, we are by Regeneration made the spiritual Children of Christ and the Pope. Here the Lord Chancellor took him up and said; that seeing all the Bishops, Universities, and the most learned Men in the Kingdom had agreed to that Act, it was much wondered that he alone should so stiffly stickle, and so vehemently argue there against it. HIS Answer was, That Is the Number of Bishops and Universities were so material as his Lordship seemed to make it; then, my Lord, I see no reason why that thing should make any Change in my Conscience: for I doubt not, but of the learned and virtuous Men now alive, I do not speak only of this Realm, but of all Christendom, there are ten to one of my mind in this matter; nut if I should take notice of those learned Doctors and virtuous Fathers that are already dead, many of whom are Saints in Heaven, I am sure there are far more, who all the while they lived thought in this Café as I do now. And therefore, my Lord, I do not think my self bound to conform my Conscience to the Counsel of one Kingdom, against the general Consent of all Christendom. That he should be carried back to the Tower of Lon­don, by the Help of William Kingston, Sheriff, and from thence drawn on a Hurdle through the City of London to Tyburn, there to be hanged till he should be half dead; that then he should be cut down alive, his Privy Parts cut off, his Belly ripped, his Bowels burnt, his four Quarters sit up over four Gates of the City: and his Head upon London-Bridge. This was the Judgment pronounced upon this great Man, who had deserved so well both of the King and Kingdom, and for which Paulus Jovius calls King Henry VIII another Phalaris. This severe Sentence was afterwards, by the Kings Pardon, changed to beheading, because he had borne the greatest Office in the Kingdom; of which mercy of the King's, word being brought to. Sir Thomas he merrily said, God forbid the King should use any more such Mercy to any of my Friends, and God bless all my Posterity from such Pardons. When he had received Sentence of Death he spoke thus with a resolute and sedate Aspect: Well, seeing I am condemned, God knows ,how justly, I will freely speak for the disburdening my Conscience, what I think of this Law. When I perceived it was the King's Pleasure to sift out from whence the Pope's Authority was derived; I confess I studied seven years together to find out the truth of it, and I could not meet with the Works of any one Doctor, approved by the Church, , that avouch a Layman was, or ever could be the Head of the Church. Chancellor. Would you be esteemed wiser, or to have a sincerer Conscience than all the Bishops, learned Doctors, Nobility and Commons of this Realm? More. I am able to produce against, one Bishop which you can produce on your side, a hundred holy and Catholic Bishops for my Opinion; and against one Realm, the Consent of Christendom for a thousand years. Norfo!k: Sir Thomas, you shew your obstinate and malicious Mind. More. Noble Sir, it's no Malice or Obstinacy that makes me say this, but the just necessity of the Cause obliges me to it for the Discharge of my Conscience ; and call God to witness, that nothing but this has excited me to it. After this the Judges kindly offering him their favorable Audience if he had any thing else to say; but that as the blessed Apostle St. Paul, as we read in the Acts of the Apostles, was present, and consenting to the Protomartyr Stephen, keeping their Clothes that stoned him to death, and yet they are both now holy Saints in heaven, and there shall continue Friends to Eternity; so I verily trust, and shall therefore heartily pray, that albeit your Lordships have been on Earth my Judges to Condemnation, yet that we , may hereafter meet joyfully together in Heaven to our everlasting Salvation: and God preserve you, especially my Sovereign Lord the King, and grant him faithful Counselors. Sir Thomas, after his Condemnation, was conducted from the Bar to the Tower, an Axe being carried before him, with the Edge towards him. Sir Thomas More having remained a Prisoner in the Tower about a Week after his Sentence, on the 6th of July early in the Morning, his old Friend Sir Thomas Pope came to him with a Mes­sage from the King and Council, to acquaint him, That his Execution was appointed to be before nine that Morning. Whereupon Sir Thomas said, He thanked him heartily for his good News. I have been, says he, much obliged to his Majesty for the Benefits and Honors he has most bountifully conferred upon me; yet I am more bound to his Grace, I do assure you, for confining me in this Place, where I have had convenient Place and Opportunity to put me in mind of my last End. I am most of all bound to him, that his Majesty is pleased to rid me out of the Miseries of this Wretched World. Then Sir Thomas Pope acquainted him, it was the King's Pleasure he should not use many Words at the Place of Execution. Sir, said he, you do well to acquaint me with the King's Pleasure; for I had otherwise designed to have made a Speech to the People; but it matters not, and I am ready to conform myself to his Highness’s Pleasure. And I beseech you, Sir; you would become a Suitor to his Majesty, that my Daughter Margaret may attend my funeral. To which Pope replied, that the King was willing his Wise and Children, and other Friends should be present. Sir Thomas Pope being about to take his Leave, could not restrain from Tears. Whereupon Sir Thomas More said, Let not your Spirits be cast down, for I hope we shall see one another in a better Place, where we shall be free to live and love in Eternal Bliss. And to divert Pope's Grief, he took up his Urinal and shook it, saying merrily, I see no Danger- but that this Man may live longer, if the King pleases. About Nine he was brought out of the Tower; his Beard was long, his face pale and thin, and carrying a Red Cross in his Hand, he often lift up his Eyes to Heaven; a Woman meeting him with a cup of Wine, he refused it saying, Christ at his Passion drank no wine, but Gall and Vinegar. Another Woman came crying and demanded some Papers she said she had left in his Hands, when he was Lord Chancellor, to whom he said, Good woman, have Patience but for an Hour and the King will rid me of the Care I have for those Papers, and every thing else. Another Woman followed him, crying, He had done her much Wrong when he was Lord Chancellor, to whom he said, I very well remember the Cause, and is I were to decide it now, I should make the same Decree. When he came to the Scaffold, it seemed ready to fall, whereupon he said merrily to the Lieutenant, Pray, Sir, see me safe up; and as to my coming down, let me shift for myself. Being about to speak to the People, he was interrupted by the Sheriff, and thereupon he only desired the People to pray for him, and bear Witness he died in the Faith of the Catholic Church, a faithful Servant both to God and the King. Then kneeling, he repeated the Miserere Psalm with much Devotion; and, rising up the Executioner asked him Forgiveness. He kissed him, and said, Pick up thy Spirits, Man, and be not afraid to do thine Office; my Neck is very short, take heed therefore thou strike not awry for having thine Honesty. Laying his Head upon the Block, he bid the Executioner stay till he had put his Beard aside, for that had commit­ted no Treason. 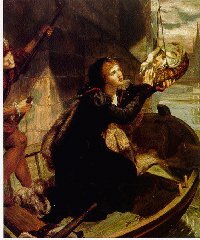 Thus he suffered with much Cheerfulness; his Head was taken off at one Blow, and was placed upon London-Bridge, where, having continued for some Months, and being a­bout to be thrown into the Thames to make room for others, his Daughter Margaret bought it, in­ closed it in a Leaden Box, and kept it for a Relique. Hall's Chron. Vol. 2. S. 2.